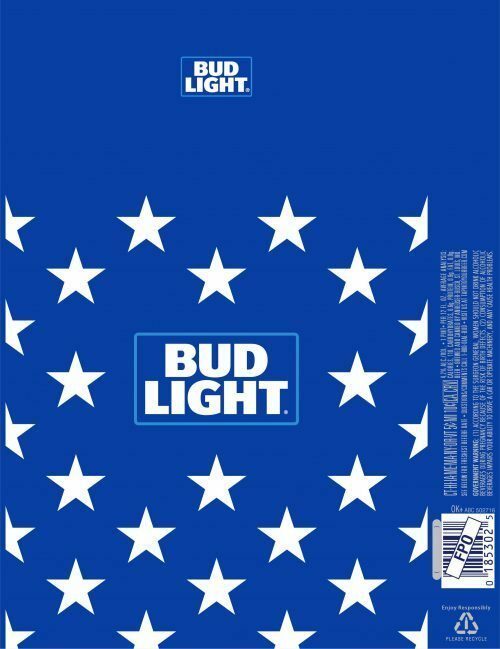 I keep hearing about a Bud label that is so overflowing with patriotic hues and cries, that there is no room for the term Budweiser. For example, this Chicago Tribune article, from just a few hours ago, suggests that the label is under scrutiny somewhere deep within the belly of the bureaucracy. Lo and behold, however, the label at issue got approved way back here, on March 1, 2016. I have no idea whether this marketing plan (taking the Americana theme to the extreme and then quite a bit further) is a good idea. On the other hand, it’s difficult to find any basis for the government to have disallowed this label. At first I thought it might not mention the brand name at all, but it does, on the neck label. 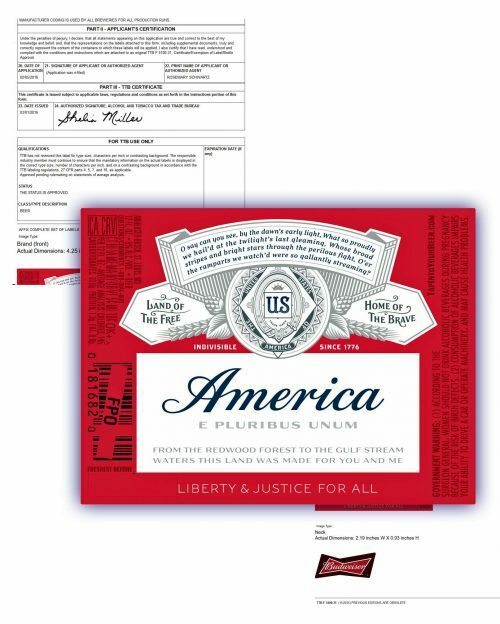 Then I thought maybe, somehow, it was so weighed down with homages to America, and so dressed up so as to resemble U.S. currency, that the term Beer did not fit on the label. But again, it is there, barely, this time at the upper right. If real patriotism were similar to the commercial kind, I would love to take a small measure of credit for this. 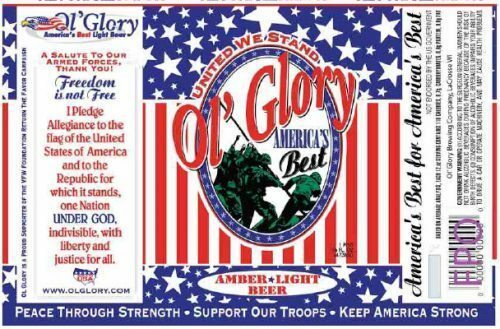 We worked on this Ol’ Glory beer label about five years ago, and it is an open question, which one takes the cake. 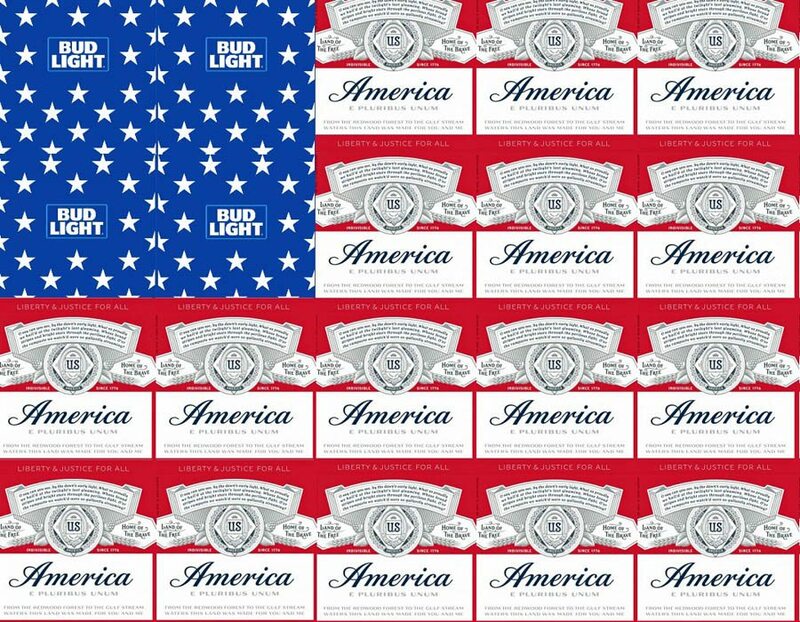 The red Bud America label will look mighty nice, in a gigantic display at 7-11, on a hot July day this summer. It will look particularly nice next to this Bud Light label, submitted within the same week. Yes that’s the whole label and it’s once again heavy on the Americana and light on the rest. At the risk of stating the obvious, a perusal of all recent Bud labels shows the advantages and disadvantages of being enormous. They can throw almost literally everything at any would be competitor: Americana, fish, soccer, kicking, shooting, baseball, festivals, concerts, hockey, basketball, football, etc.